There's not a whole lot of space for me in my current apartment, so some recipes are on hold until I move (2 more months!) and have more space to hold ingredients, cookware, etc. One day I just desperately wanted chocolate chip cookies. I even had all the ingredients! Well...almost all. I did not have baking powder and/or baking soda. Which was required for EVERY recipe. And, I was lazy, I didn't want to have to go out and buy any. Not to mention I wasn't sure I'd have room to store the leftover. Then, in a remarkable quirk of fate, I stumbled upon a Bisquick chocolate chip cookie recipe! "Whaaa???" I thought! I debated it. I was like, "What if they're bad? Then it'll be a complete waste!". I even petitioned my facebook friends to see if they had any experience with this (no one did). In the end I decided "I really want chocolate chip cookies. And how bad could it be?". Ah! Sorry, got distracted. 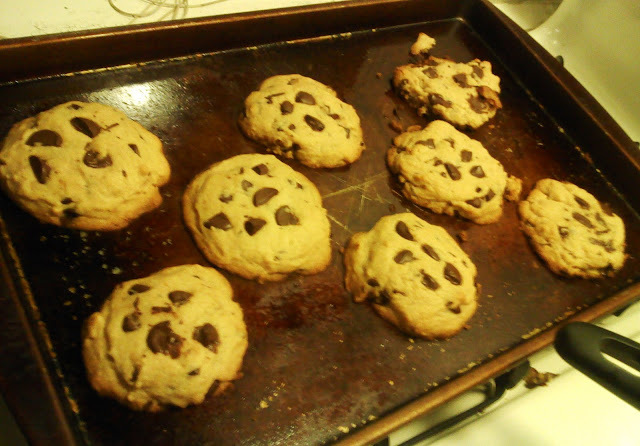 Anyway, I baked them (what was left after I assaulted the dough), and ate them, and they were great! The texture is definitely different, it will be obvious this is different than a normal cookie, it sort of reminds you of a Bisquick biscuit (which makes sense), but in a still perfectly tasty way! Don't get me wrong, I would never choose these before a good old fashioned real chocolate chip cookie. But, if you are feeling lazy, or just are missing a couple ingredients, these are a great way to still get your cookie fix! There are certain recipes you will always find a million versions of, everyone's got their own kind. This applies to (for example) chocolate chip cookies, chocolate lava cakes, spaghetti and meatballs, and macaroni and cheese. For a recipe-o-phile like me, this means you end up with a looot of different recipes, for one thing (don't even get me started on how many chocolate chip cookie recipes I have). The hope is, once I try them out, I will be able to narrow it down to one recipe (or...at least less). After the first time I made this macaroni and cheese, I deleted all other mac'n'cheese recipes, and no longer even look at others. It is unnecessary. I know I will not like anything more than I like this. I am in a monogamous mac'n'cheese relationship, and I have no desire to cheat. It is a "healthy" (ish) version, it is full of flavor, is thick and creamy, and makes you happy!